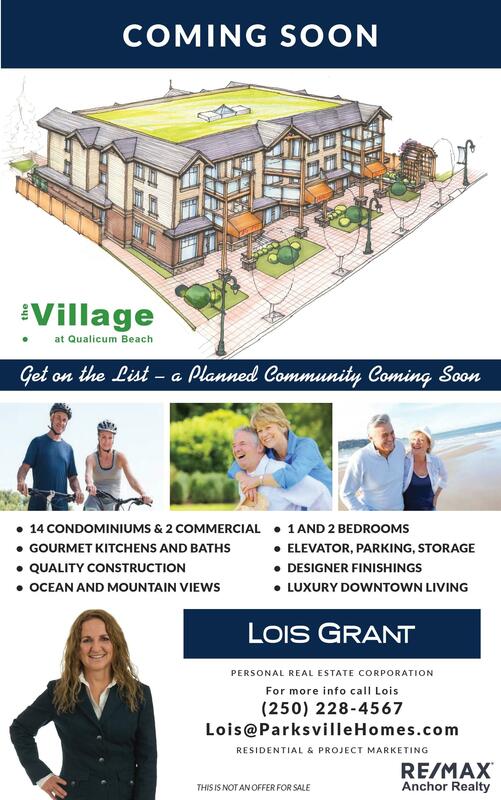 Coming soon to Qualicum Beach is a new condo development called the Village which will be located at 210 W. First Avenue, Qualicum Beach. This thoughtfully designed development will provide only 14 exclusive condos and 2 commercial units. There will be a combination of 1 and 2 bedrooms with designer kitchens and bathrooms, quality fixtures and flooring, contemporary open concept floor plans, high end quality throughout, elevator, balconies and parking. Perfectly located in downtown Qualicum Beach with all amenities at your doorstep. Enjoy the quaint life-style Qualicum has to offer with yoga studios, restaurants, library, Qualicum Recreation Centre, cafes, bakeries, parks, walking trails, golf course and an easy walk to Qualicum’s incredible sandy beach. (This is not an offering for sale). *Please provide your mailing address in the comments if you wish to have a package mailed out to you.